ZenTile makes the task of creating textures for models both fun and easy. There are four styles of tiling and when you consider the number of other options the possible results are nearly infinite. 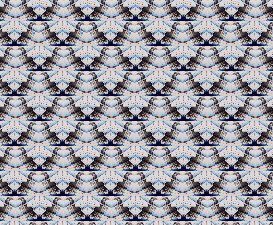 You can flip the picture horizontally or vertically either before or after tiling greyscale it force a rectangular picture to tile as a square vary the size of the tiles quarter-and-blend it before tiling and re-tile after tiling either a selection or the entire tiled texture. You can use ZenTile for purposes other than tiling as well. It will create heightfield maps and has a powerful greyscale tool with 4 types including the unique Zenware Truecolor greyscale which can be applied to any of the RGB channels or all three. Truecolor greyscaling yields a picture with a depth and crispness unmatched by any other method. Try it once and you will never want to look at a muddy 256 color greyscale again! Textures can be produced at 1024X768 or 2000X2000 sizes. You can cut and paste from the raw texture to your texture template or simply load the entire texture in Poser for a quick look. 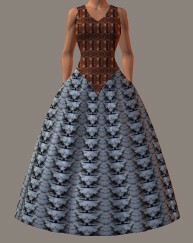 Here is a dress for Posette done this way which took less than a minute to produce and view. ZenTile 2 will accept files dropped on it but it also has a File Manager that is a vast improvement over Windows Explorer. When you click on a file you are told the file size in bytes file date width and height of the image the color depth and a thumbnail is shown. You can rename delete and move files as well as do a Find. For fast navigation there is a recent files list AND a recent folders list. No more repeatedly drilling down through a dozen subfolders to reach the one you want! The recent files list is also available directly from the main file menu. Another new feature for ZenTile 2 is the Graphics Viewer. This is a full-featured viewer displaying image width height and color depth with a "Next" and "Previous" button to step through a folder as well as the ability to show pages of thumbnails which can be printed with a single click. The images themselves can be printed as well with a printing module that allows you to set margins or center the picture -- in English or Metric measurements. You can directly delete an open image and open new ones with direct access to the File Manager. If you see an image you would like to tile simply click the "Tile" button. If you would like to see how it looks tiled but not immediately just click the "Add" button and it will be added to a list. In the main window a new "Tile List" item will appear on the File menu. Clicking this will show your list which can be edited. Click "OK" and the list will be tiled with pauses for you to make adjustments to the way each picture is tiled. This is a good way to make choices between similar pictures or to quickly see the results of different settings with the same picture.